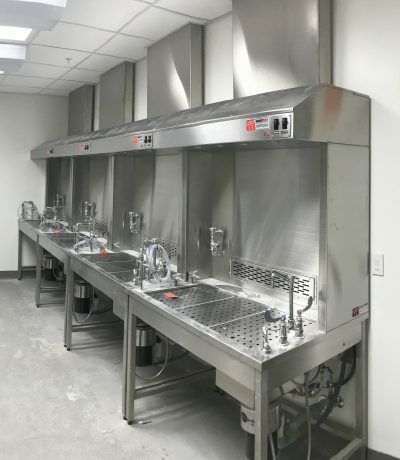 Our backdraft workstations are multi-use, ventilated units for gross examination and sectioning of specimens, animal necropsies, surgeries, perfusions, dissections, and chemical handling. The tables use a negative air source to pull air, odors, vapors and aerosols back away from the faces of users. The backdraft design helps keep chemicals such as formalin, alcohol and xylene under control and below permissible OSHA exposure limits, making for a healthier, safer work environment. This picture shown may include options or accessories that are not part of the standard item. Please be sure to include any options that you may need with your table. We understand that every project is unique. If you have special requirements, we can modify the stations to suit your needs. A custom layout can consist of modifications to allow larger or restricted work areas, additional utilities, shelving, drawers and ventilation.